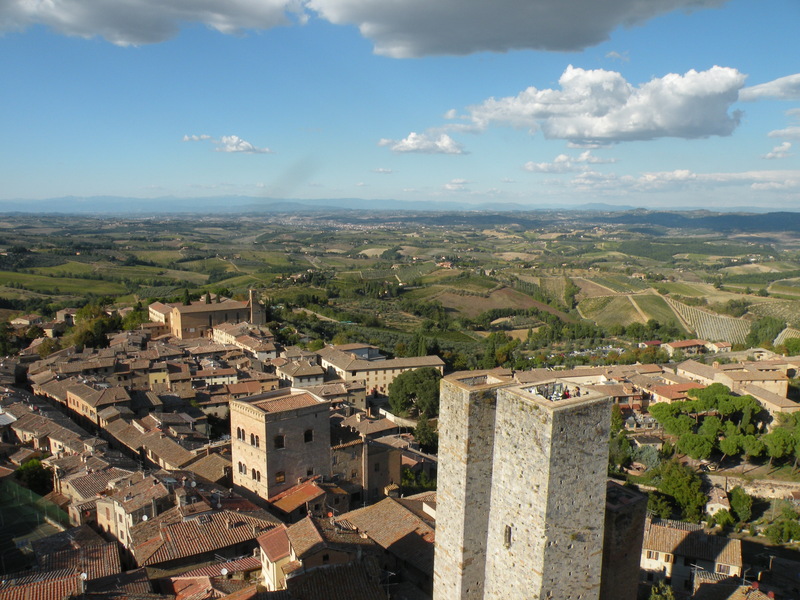 San Gimignano – the Tuscan City of Towers! It’s an entrancing place and one that I love returning to again and again. I’ve visited San Gimignano four times and I’m not tired of it yet. Yes, it’s crowded, particularly on hot summer days, and yes, it’s touristy. But unlike some of Italy’s most visited cities (think Florence! 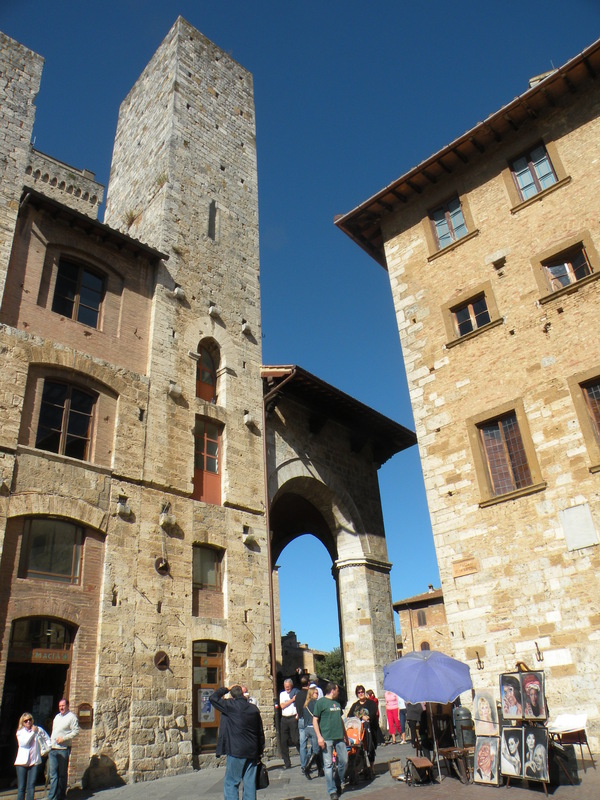 ), San Gimignano manages to retain its medieval charm. Even on the most tourist heavy days, you just need to walk a few paces and you are virtually alone in a quiet back street with only a few birds and an old guy sweeping his front stoop for company. The heaving, sweating, shopping masses of humanity that pack the main piazzas and drip gelato on the cobblestones are a distant memory. You are in the 14th Century, your long gown swishing around your legs, your ears attuned to the bells that divide your days and regulate your life. If you are a woman, you might be on your way to the market to buy food for supper or to the baker up the road for a loaf of fresh bread or to the Church to make confession. If you are a man, you could be setting off to a meeting with a kinsman to settle a festering vendetta or to chat with a fellow guild member about your trade. 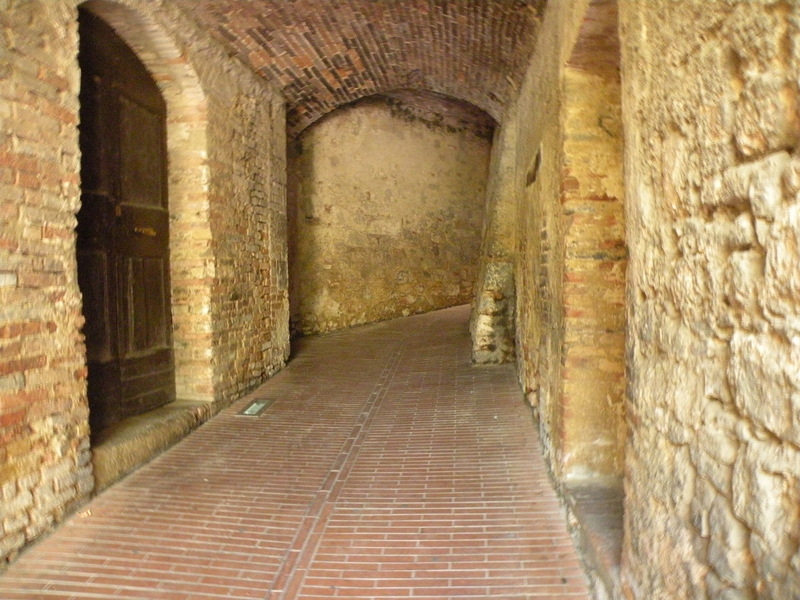 When you walk the back streets of San Gimignano in the 21st Century, you are only an ounce of imagination away from identifying with the hundreds of thousands of people who have walked these same streets for over a millennia. My favourite thing to do in San Gimignano is to walk the quiet back streets because that’s where my imagination can roam with medieval freedom. I’ve come up with five things you can do in addition to wandering the streets that will make the day or two you spend in San Gimignano worth remembering. Before I get to my Top Five list, here’s a overview of my favourite Tuscan town. 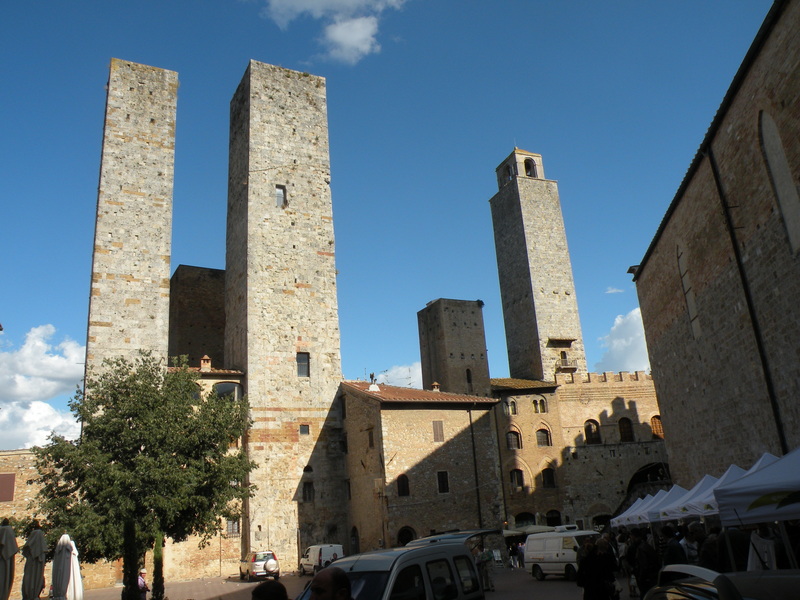 San Gimignano is often called the Tuscan city of towers because 14 medieval towers are still standing. In its heyday in the 14th Century, San Gimignano’s skyline was dominated by over 70 towers. Many of the palazzos in most Tuscan towns of the period included towers, but over the years most of these towers have crumbled as a result of age or attack. San Gimignano is unique because so many of its towers remain. Why so many towers? Well, they weren’t built to give 21st century tourists something to photograph. The towers were attached to the homes of the wealthiest citizens who frequently vied with each other over which family could build the tallest tower. In fact, a law had to be passed in San Gimignano to prohibit any private citizen from building a tower higher than the Torre Grossa that rises above the Palazzo del Popolo, also known as the Palazzo del Podesta. The Torre Grossa is one of the towers that has survived to this day. The citizens of San Gimignano were a bit of a bellicose lot and sometimes towers were attacked and destroyed. The family feuds that form the basis of the Romeo and Juliet story were most definitely not fiction. Vendetta and its accompanying violence was the all too common way to settle differences. San Gimignano was first settled in the fourth century BC by the Etruscans, but it wasn’t until between 1000 and 1200 that San Gimignano really began to grow. Thanks to its proximity to the Via Francigena, a major route across Italy, San Gigminano was an important stopover for travelers, pilgrims, and merchants. The town became steadily more prosperous until it declared itself a free Commune in 1199. The cultivation of saffron from the stamens of crocuses was big business, along with textile manufacturing and the production of Vernaccia, a lovely white wine still produced today (it’s very good!). In 1300, Dante came to San Gimignano and in 1317 the famous painter Lippo Memmi opened an artist workshop and with his father painted a fresco in the town hall that you can visit today (it’s one of my top five attractions). Top of my list is the wonderful San Gimignano 1300 museum. 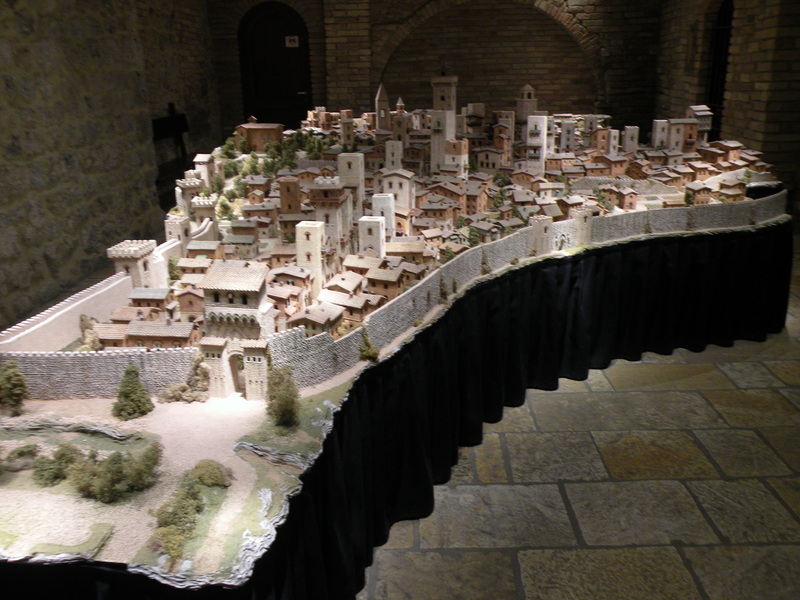 Here, you will find an amazing scale model of San Gimignano as it appeared in the year 1300 with its seventy-plus towers. A guide takes you around the model and explains how and why it was made and how people lived back in the 14th Century. Not long after I started my novel The Towers of Tuscany about a woman painter in the 14th Century, I came across the Web site for San Gimignano 1300. I could not believe my luck! Just when I was immersing myself in research for the novel, someone had very thoughtfully recreated the entire city in which much of the novel’s action takes place. I had to see it! A few months after I found San Gimignano 1300 on the Web, I was there in person. Few things get in the way of an historical novelist on a research warpath! In addition to the scale model is a lovely museum that includes dioramas of city and home scenes. I have a bit of a soft spot for museum dioramas and the ones in the San Gimignano 1300 museum are particularly well done. The staff at San Gimignano were just lovely. I told them I was researching a novel that would be set in San Gimignano in the 14th Century and they were so delighted. I can hardly wait to send them copies of the finished book! Unlike many Italian towns, San Gimignano is stuck in a medieval time warp. Most of the frescoes and paintings on display in the Museo Civico and the various churches are medieval, not Renaissance. As someone who actually prefers the flatter, more stylized work of the medieval painters to the rather florid realism of the Renaissance, I’m in art heaven in San Gimignano. First stop for art lovers should be the frescoes in the Museo Civico (also where you’ll find the Torre Grossa described below). Painted by Memmo de Filippuccio and his son Lippo Memmi in 1317, the frescoes portray scenes of everyday life—a rarity at a time when the vast, vast majority of frescoes and paintings depicted religious subjects. My favourite scenes in the frescoes (well, everyone’s favourites actually) are two scenes showing a newly married couple first enjoying a communal bath together (ooh la la) and then climbing into bed. It’s interesting to note that they are sleeping naked. While researching my novel, I read that people often did sleep naked during the period to prevent bringing some of the wee beasties that invested their heavy gowns into the bed. Also, I should imagine that the summer weather in San Gimignano got just as hot in the 14th Century as it does today. The other frescoes worth seeing cover the walls of the Duomo in the Piazza Duomo, right in the centre of San Gimignano. One set, painted by Bartolo di Fredi in 1356, depict scenes from the Old Te3atment. I particularly like the figure of Noah lying drunk on the ground, his gown open to reveal that he is most definitely not wearing his boxer shorts. There’s nothing new under the sun! Another set of frescoes depicting Hell were painted by Bennozzo Gozzoli in 1465. The frescoes are terrifyingly realistic. You might want to avoid them if you’re traveling with children. The tallest tower in San Gimignano at 54 meters (178 feet) is the Torre Grossa. It’s part of the Palazzo Communale where the Museo Civico is housed. It is very much worth the effort to climb to the top. I did not do so on my first three visits to San Gimignano (just lazy!) but on this last trip, I made the effort and was well rewarded. The view is stunning. If it’s a fine day, go early or late to avoid the crowds. Ahhhh….! The tour buses have puffed down the hill, the shops are shuttered, and peace descends. Thanks to floodlit towers, the darkness never gets close to the black intensity of the olden days, but your imagination can still get a workout. Enjoy a lovely meal at one of San Gimignano’s restaurants and then walk off the pasta and wine with a stroll through the quiet piazzas. The later it gets, the quieter the streets. And, unlike the 14th Century, walking the streets of San Gimignano after dark is not dangerous. No assassins are intent on revenging a vendetta; no watchmen are standing by to clamp into irons people ignoring curfews. 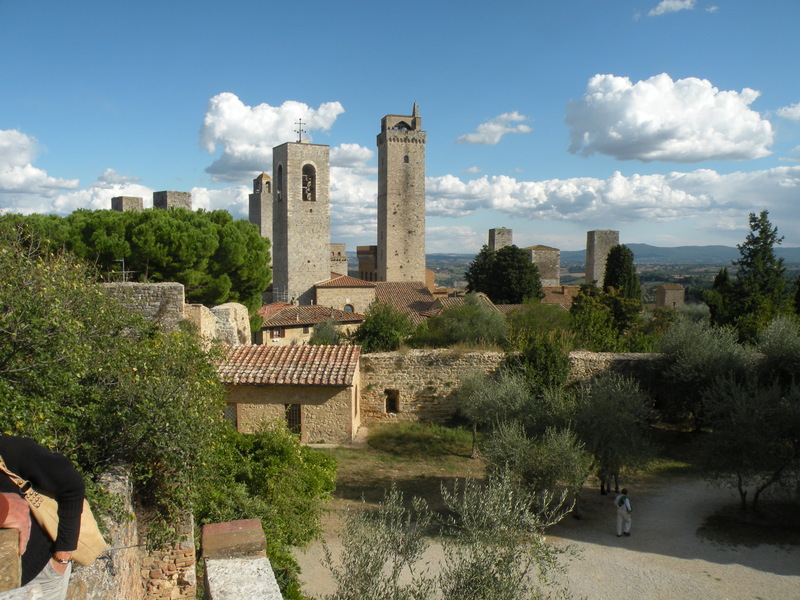 Some guides to San Gimignano will also mention the two torture museums. I don’t get the point of these kinds of sensationalist “attractions” and avoid them at all costs. Yes, we know punishments were harsh in the middle ages; they’re no picnic nowadays in many parts of the world. I doubt we help matters much by ogling gruesome displays of pain, but that’s just me. San Gimignano is best enjoyed over a few days. Many coach trips pop in and out in an afternoon –long enough for people to sip a cappuccino, climb a tower, and go shopping. But if you really want to experience San Gimignano, stay a few days, preferably at one of the lovely hotels in the nearby countryside. In another post, I’ll talk about two of my favourite hotels, along with some recommended restaurants. Sofia pushed back from the table and rose to her feet. Massaging with one hand a knot in her shoulder, she stepped to the narrow window. Between the two closest towers, the countryside beyond the town was just visible as a slit of green and gold. The commune of San Gimignano fairly bristled with towers. Just the other day, Sofia had counted more than seventy. Day after day, the pounding and clanging of endless construction filled the air, along with dust so thick that on windless afternoons citizens squinted across the Piazza della Cisterna. Best times to visit San Gimignano are late spring when the surrounding countryside is drenched in the freshest greens imaginable and in September/October when golden light and crisp days make sightseeing a pleasure. Just remember to take along a rain jacket and a sweater.